Why not visit the Royal Duchy this Winter? We are open all week for coffee, lunches and afternoon teas. Join us on a Sunday for a fabulous traditional lunch for only £20.00 per person for three courses plus coffee. If you are in need of time to relax why not book at treatment with our therapist? Pop in and see us or call 01326 313042 for details. Be the first to receive exclusive offers and latest news from The Royal Duchy hotel . 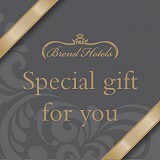 Royal Duchy Hotel vouchers, our special gift for you. We currently hold four and a half stars on Trip Advisor for The Royal Duchy Hotel and Brend Hotels are holders of the accolade for AA Hotel Group of the Year 2015-16.